One of my goals this year is to use what I have. The base of this card is craft stock. The red and gold metallic paper has been hanging around my craft room for Years. They are from Hot off the Press - Paper Pizazz - Metallic Gold. The punched trim is from DCWV Metallic textured stack. Also paper that's lived in my craft room for many years. The snowmen are from Uptown Rubber stamps designed by Sandi Gore Evans. The sentiment on the outside is from Northwoods and on the inside is from Stampendous. The punches are Martha Stewart. The ribbon is from my stash and was on one of my Christmas gifts. The inside was also made from bits and pieces. The Teddy Bear is a left over embellishment too. The rubber stamp is from Stampabilities. 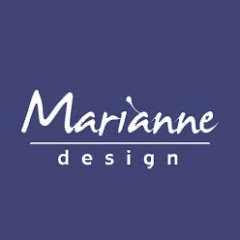 This month Marianne Design is offering a most generous prize. You could win two dies or one die and a rubber stamp. Head over to the Sparkles Christmas Challenge and check out the rules, add your card and have a look at what the design team made this month. Super cards Mary, love your choice of Christmas Carols.